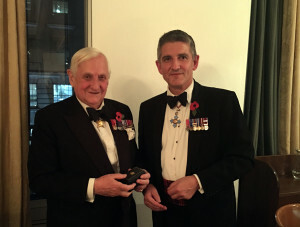 Last night Lieutenant General N Pope CBE had the pleasure of presenting Field Marshal Sir John Chapple GCB CBE with his Long Service and Good Conduct medal at the annual Gurkha Brigade Association Dinner. Recent changes to the rules of the award of the medal mean that all serving Officers are now eligible to receive the medal and this includes the retired Field Marshal who is still on the Army Staff List. Field Marshal Sir John Chapple commissioned as a 2nd Lieutenant in the Royal Artillery on 3 June 1950. He served with the regiment in Malaya, Hong Kong and Borneo. He was promoted to Captain in 1957 and to Major in 1964. Appointed a Member of the Order of the British Empire in the Queen’s Birthday Honours 1969 and promoted to Lieutenant Colonel the same year. He was appointed Commanding Officer of the 1st Battalion, 2nd Gurkha Rifles in 1970 and made a member of the Directing Staff at the Staff College, Camberley in 1972. After spending much of the year as a services fellow at Fitzwilliam College, Cambridge in 1973, he was posted to the Directorate of Staff Duties at the Ministry of Defence at the end of the year and, having been promoted to Colonel on 31st December 1973 and to Brigadier on 31st December 1975 was made Commander of the Gurkha Field Force in 1976. He became Principal Staff Officer to the Chief of the Defence Staff in 1978 and having been appointed a Commander of the Order of the British Empire in the Queen’s Birthday Honours 1980 he became Commander of British Forces in Hong Kong on 13th June 1980 with the substantive rank of Major General from 1 January 1981. He returned to the United Kingdom to be Director of Military Operations at the Ministry of Defence on 19th October 1982. Appointed a Knight Commander of the Order of the Bath in the Queen’s Birthday Honours 1985 he became Deputy Chief of the Defence Staff (Programmes and Personnel) on 2nd January 1985 in the rank of Lieutenant General and was then appointed Commander-in-Chief, Land Forces on 1st June 1987 with the rank of General from 29th June. He was appointed Aide-de-Camp General to the Queen on 6th October 1987 and advanced to a Knight Grand Cross of the Order of the Bath in the Queen’s Birthday Honours 1988. His last appointment was as Chief of the General Staff from 10th September 1988. He served in this post, in which he provided military advice to the British Government on the conduct of the Gulf War, until he retired with promotion to Field Marshal on 13th February 1992. He was also appointed Colonel of the 2nd King Edward VII’s Own Gurkha Rifles (The Sirmoor Rifles) on 14th September 1986 and Honorary Colonel of the Oxford University Officers Training Corps on 21st July 1987. He was also a trustee of the Gurkha Museum from 1973 to 2003, a trustee of the National Army Museum from 1981 to 2003, a trustee of the World Wildlife Fund UK from 1988 to 1993, President of the Zoological Society of London from 1992 to 1994 and Governor of Gibraltar from 1993 to 1995. We would like to thank the Field Marshal for his continual support of the Brigade and the Association.